Are you feeding a crowd and looking for an all in one dish that is easy to make, easy to serve and would please everyone. 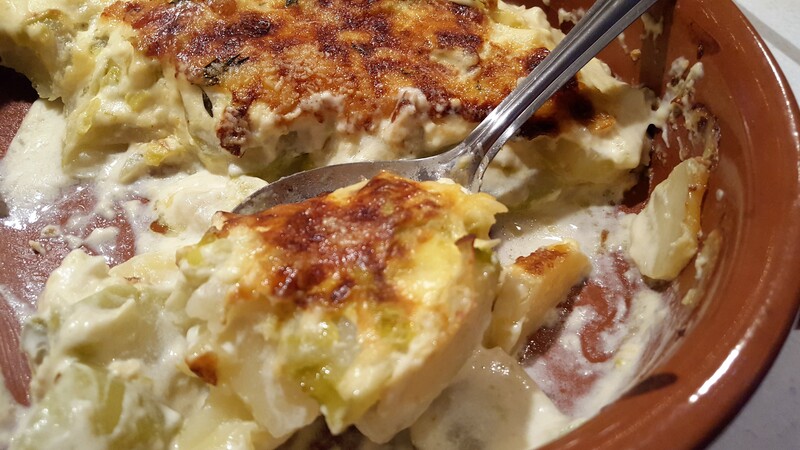 How about a cheesy, tasty gratin made with a combination of the much loved spuds and chayote (chow-chow). 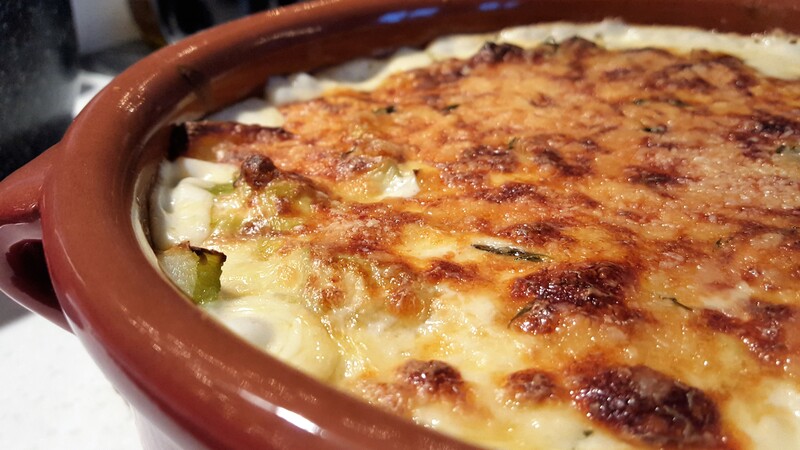 This is a rich gratin but still healthy with abundance of fresh herbs and leek. 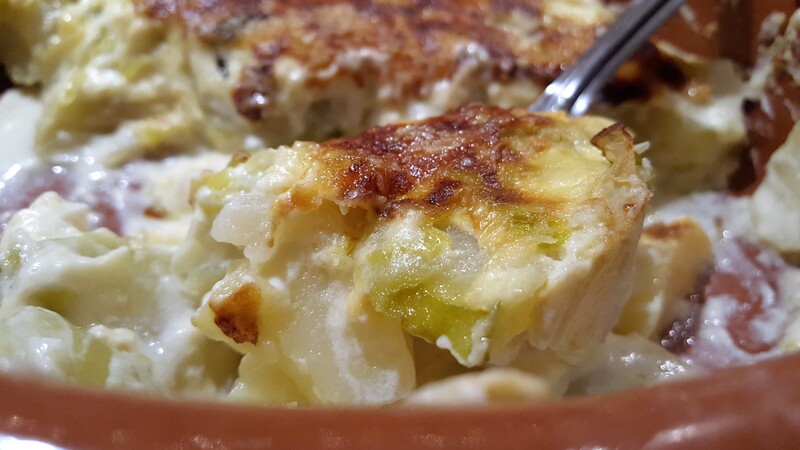 Chayote gratin is a very popular dish we used to have at the weekend to accompany roast or grilled meat. 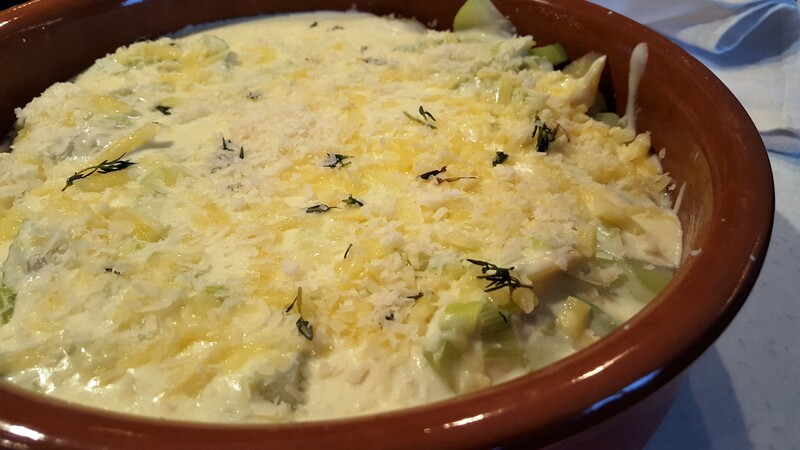 Chayote is a very healthy vegetable that contain lots of water (low calories), I add potatoes in this gratin which helps to thicken the sauce and soak up the moisture from the chayote. Such a great dish to accompany a roast dinner or can be eaten on its own which makes wholesome vegetable dish with crusty bread. Peel the chayote and Potatoes and cut them into thick slices (approx. 1cm / ¼ inch). Place in a microwave dish/steamer, season with salt and steam on high for 5-8 minutes or until they are soft not but not mushy. Meanwhile prepare the Béchamel sauce (also known as white sauce made from a white roux and milk). Place a deep saucepan on medium heat. Add the butter and olive oil followed by the sliced leek. Cook until translucent and soft, turn the heat on low, add the flour and stir vigorously. Leaving the saucepan on low heat, start adding the milk a little at a time, using a whisk mix all to prevent and lump forming. Add the cream and bring the mixture to the boil, stirring constantly, so that the mixture thickens and becomes glossy. Add 2/3 of the grated cheese and rest for the topping while it’s baking. Remove from the heat and season with salt and pepper. Add the fresh thyme and stir well. 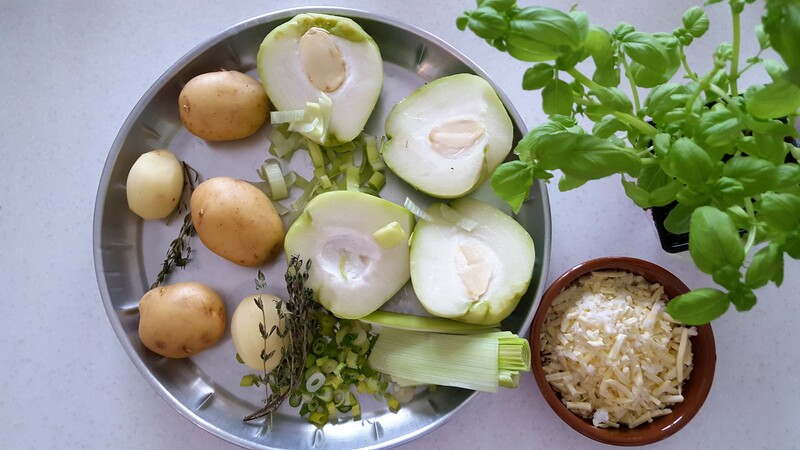 Place the steamed chayote and potato in a deep ovenproof dish, pour the thick sauce over the vegetable and on top been added and the sauce starts to thicken. Sprinkle with the reserved grated cheeses and bake in the pre-heated oven for 25-30 minutes or until it’s golden and a crispy cheese top is formed on the top.